Air fan provide air source for the whole system. Based on VPSA oxygen generator design condition and customer requirements, fan with proper outlet air pressure is to be provided. Vacuum pump ensures correct system operation and keeps the system in ideal vacuum state, which ensures equipment constantly adsorb nitrogen and produce oxygen. Air temperature regulating system is made up of a water cooler and an electric heater. The temperature of air compressed by fan is around 65oC-70oC, passing the water cooler, its temperature is reduced to meet the requirements of process operation. Then it is sent into the adsorption towers. In winter, the temperature of air is to be increased by the electric heater and reaches the requirements of process operation. 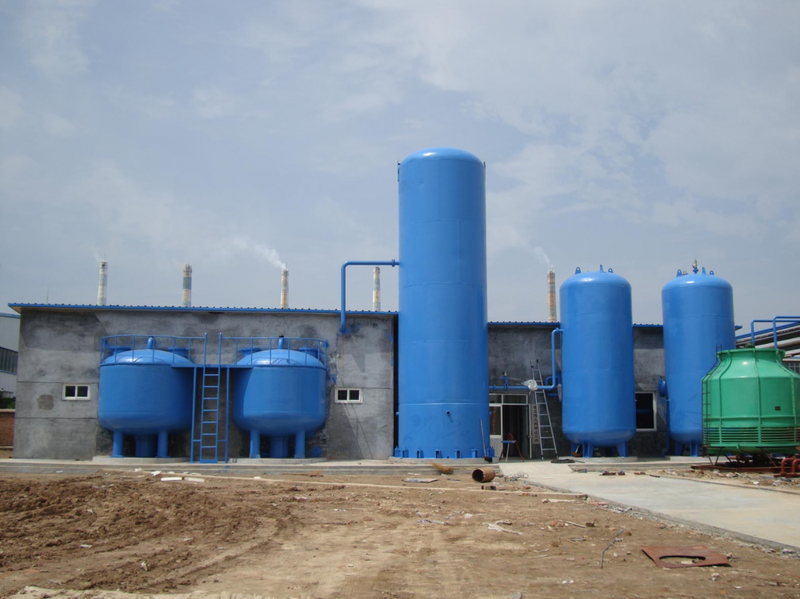 The adsorption system mainly consists of two towers filled with zeolite molecular sieve adsorbents and piping valves etc. Air enters into the bottom of one tower, when passing through the adsorbent layer,N2, Coxygen, Vapor are adsorbed by molecular sieve and oxygen passes through the adsorbents and gathers at the top of tower, flowing out as produced gas, meanwhile the other tower is in the process of regeneration. When the adsorbing tower almost reaches saturation, by the operation of control system, the processing air flows into the regenerated tower and begins to produce oxygen.Two towers alternately adsorb and constantly produce oxygen . Compared with three-tower process, oxygen generator with two towers can not produce consecutive oxygen, therefore, a buffer tank with large volume is needed for stable oxygen output. 1.5.1System process is achieved by DOS control system. In this system, valves switches are independently controlled by PLC (Programmable Logic Controller). Analog signals of test sensors communicate with the main control system through specific communication protocols. Relevant data of specific unit can be sent to main control system and remote control signals of main control system can be accepted by specific unit. 1.5.2In order to ensure safe oxygen supply, functions of interlink, protection, alarm, print, record etc can be provided. 1.5.3The output variation of oxygen supply can be adjusted by DCS control system. System operating parameters can be adjusted to save energy. 1.5.4The main control system adopts industry computer, provided with specific software and convenient human-machine touching screen, Start/stop and operating parameter collection can be realized on control panel. Remote monitor and print of running status record can be easily achieved. 3.1 Quick and convenient start and stop. 3.2 Low investment and energy consumption. 3.4 Simple operation and maintenance. 3.5 Short installation period and small ground treatment workload. Looking for ideal VPSA Generator Plant for Metallurgy Manufacturer & supplier ? We have a wide selection at great prices to help you get creative. All the Energy Saving Oxygen Generators are quality guaranteed. We are China Origin Factory of Metallurgical VPSA Oxyge Generators. If you have any question, please feel free to contact us.